"Gracie, why should I give your mother a bushel of nuts? What'd she ever give me?" "Why, George, she gave you me. And, I'm as good as nuts." George Burns once declared that his wife was "smart enough to be the dumbest woman in show-business history." And, indeed, Gracie Allen leaves her verbal opponents dazed and confused, and leaves her audience in stitches. Singing and one-liner slinging George comes across as a blithe bystander who had once meandered over to befriend a befuddled-but-beguiling broad and discovered, to his absolute astonishment, that he couldn't possibly walk away. The madcap scenarios and rib-tickling ripostes in these sixteen digitally remastered episodes are as cleverly sharp now as they were when they were originally broadcast in 1947-48. 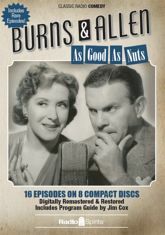 This 8 CD set includes many episodes available for the first time anywhere, and a Program Guide by Jim Cox featuring photos and background information about the show.